What suggestions do you have for the MBA program? How can we do better? Another fun Holiday Party with NSHMBA and other local universities. To view and/or download the photos of the event, click here. We look forward to seeing you at our 2016 Kickoff Party! We want to thank those that attended the 'Back to the Future' theme social last Wednesday, October 21, 2015 at Belvedere. We had such a great time mingling and networking with nearly 40 attendees while listening to the hits of the 80s and taking pictures with 'Back to the Future' backgrounds. We hope to see you at our next social! Mr. Richard Davis, Chief Operating Officer of Katalyst Data Management, the global leader in subsurface data management, senior management strategist and Fellow of the Royal Geographic Society, was the School of Business Administration distinguished speaker. Mr. Davis shared insights into his global career and how he has become a dynamic driver of innovative growth and change in the area of business operations as applied to information technology in energy-related industries. As a geophysicist and in IT Operations Management, Mr. Davis has held leadership positions at Schlumberger, Transocean and KBR. 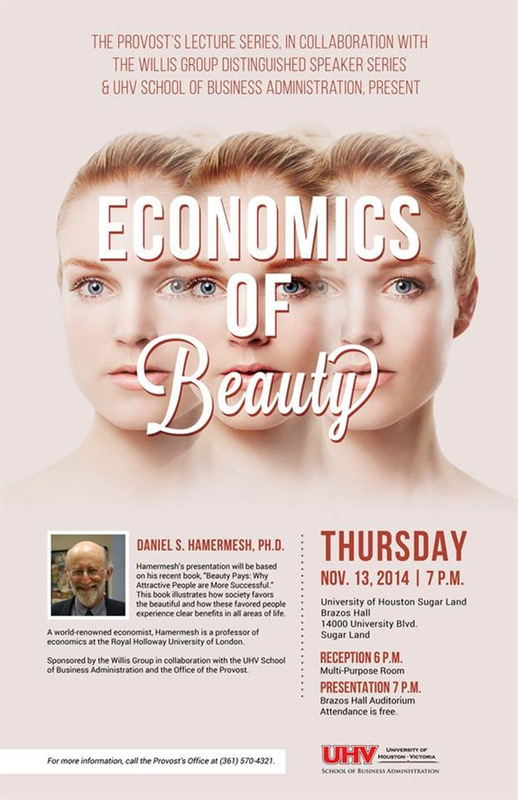 On Thursday, November 13, 2014, Dr. Dan Hamermesh delivered a dynamic presentation about his research: "Beauty Pays: Why Attractive People are More Successful" at the University of Houston Sugar Land campus. Dr. Hamermesh has been featured on many TV and radio shows, including Good Morning America and PBS Evening News Hour. Dr. Hamermesh was also featured on the Daily Show with Jon Stewart. See video above. You can also find the video by clicking on the URL below.